I'm glad because fortunately, there's no end to the list of ways you can eat grape or cherry tomatoes, from popping them right off the vine and into your mouth (my beau's method of choice) to mixing them into pasta salad or, my current favorite, slipping them into a frittata. That frittata is currently coming up against some tough competition as reigning favorite, namely this lima-less version of succotash. I probably sound like a broken record at this point, but I'm so proud of myself and my man for taking this garden project all the way to fruition. It's often been a frustrating struggle and downright hard at times, and if nothing else, I have a new and huge appreciation for the people who do this for a living (and also for my grandparents, who STILL garden, even in their 90s!). This is another dish composed primarily of ingredients we grew ourselves, and that seems to make it taste extra good. Though we have lots of yellow pear tomatoes too, I used the little red sweeties in this dish--they're juicy and delicious! The cucumber, pepper, and basil came from the garden too. We're not-so-patiently waiting for the corn to mature, and then this can be a completely homegrown dish. As usual, adjust the proportions and seasonings to your tastes, but above all else, make this perfect summer side! 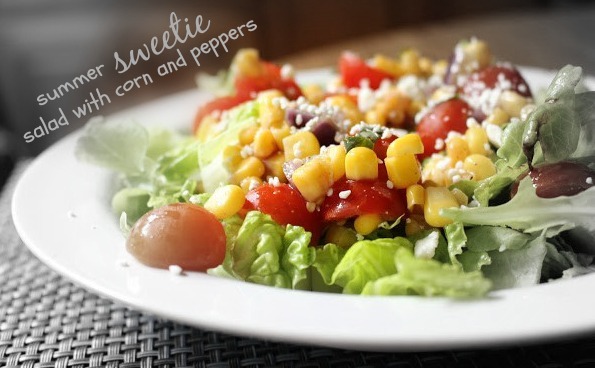 Place the corn, tomatoes, cucumber, pepper and sliced basil in a large bowl. Sprinkle with cumin, pepper, salt and sugar, and squeeze a lime over the top. Stir until everything is evenly coated. Refrigerate for an hour or so to let everything mingle. When ready to serve, top with cheese and a splash of balsamic vinegar. Homegrown tomatoes are so much juicier and sweeter. This salad looks right up my alley, Grace. Such a pleasure to use food you've grown yourself in a dish...haven't had anything but an herb garden for years, but I do remember how proud I was of my vegetable garden when I lived in Michigan. Your salad looks a delight, Grace, I just know those tomatoes are sweet and delicious! Congrats on your homegrown salad. It is so worth it. Nothing tastes quite as fresh as when you grow it and pick it yourself, just minutes before you eat it. What a treat! That is awesome! It must taste all the much better if you have grown it yourself (and I've often found home grown tomatoes sweeter than the kind that you buy). 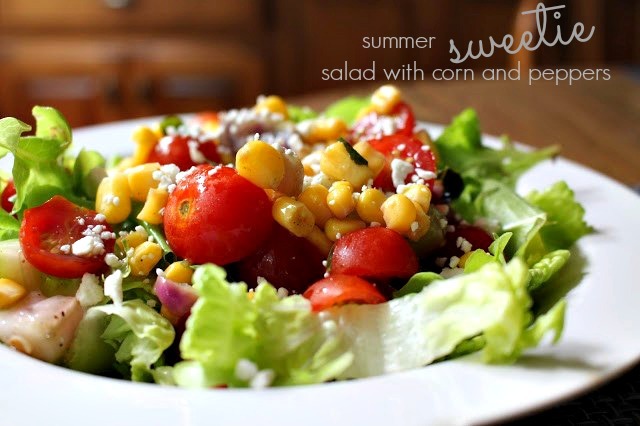 Looks like the perfect summer salad! That is so impressive that your grandparents are still gardening.... Love it! I'm quite envious of your garden! Gardening is good for the soul, especially when you can plate your efforts. This salad looks fabulous. Kudos! This looks like summertime on a plate - and even more delicious that it comes from your own garden! WOW! So colorful! Love this plate! Looks delicious! We are being over run with tomatoes so this fits right in. This salad looks so delicious and having homegrown vegetables makes it even more special. When I was on my vacation a gopher ate my last three tomato plants. Cherry tomatoes are one of the best parts of summer!! This salad is the perfect way to eat them. Good for you for having a garden. I love every single ingredient in this salad! It looks tasty. Eating from your own garden definitely makes a difference! Great looking and delicious salad! Congrats on your tomatoes--my tomatoes have decided not to grow this year. They aren't dying, they are just staying little 3 inch plants. Life can be so strange sometimes. Glad you are having success and finding lots of things to do with the harvest from all those plants!